Last month (April) was the most successful I've had with The Online Darkroom since launching it onto an unsuspecting public three-and-a-half years ago. The blog continues to grow with that growth closely linked to the frequency of posting. There's a simple correlation between the number of posts published in a month and the "hits" I receive as a result. No real surprise there. What was very surprising, however, when I looked at April's stats was the success of one post in particular. No, it wasn't one featuring my ground-breaking, earth-shattering photographs or flowery prose but a quick post about the new Intrepid 5x4 plywood camera. It garnered five times as many hits as the pre-exposure post involving Barnbaum and Thornton, for example. 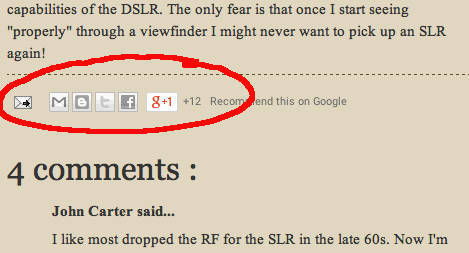 After just two weeks it was my fifth most popular post of almost 500 I've written for The Online Darkroom. That's quite an achievement as the four above it are at least a year old and have had more time to accumulate hits. The reason for the success of the Intrepid post was mainly down to the number of "shares" it got on Facebook. Photographers, it seems, are very willing to let their pals know about a new camera coming onto the market and they, in turn, let their pals know. Before long, there's some sort of exponential thing going on which results in loads of people visiting this blog to read that post and then some others. When it comes to social media, I usually write a little about my latest posts on Google+, Facebook and Twitter and this has made me realise just how powerful they can be when it comes to attracting new readers. I got to thinking that perhaps I should ask my loyal readers to help me out a bit by sharing posts they like on their social media outlets of choice. If you click on one of the wee boxes circled in red you can share the post with these powerful social media sites. It's something that should take just a few seconds and yet might make a big difference to the readership of this blog. The nice thing is that I'm fairly sure I get an email alert about every "share" so I can see those readers who have made an extra effort to help The Online Darkroom and to whom I should be thankful. Maybe, if TOD can grow big enough, I might be able to start making some money from the website which would save me from having to go out and get a proper job - something that would almost certainly see this wee project coming to an end as there are only so many hours in a day. I'd love to be able to keep on blogging but sometimes things are outwith our control. So please give consideration to this request and I'll hopefully be able to report back next month with more good news on the "hits" front. I am happy to support this Bruce although I'm a dinosaur when it comes to social media. I am however on facebook and I'll share anything that I think people will find interesting. I certainly would not like to see your blog end. I look forward to reading all of your articles. Thank you for putting in the work! Bruce, why don't you do as some other blogs do and add a link of some kind that allows people to make a financial contribution? I've thought about that Dave but from what I can see the response rate is usually measured in fractions of 1%. Might be worth a go, though, as you never know.